With the rise of technology and the connected world at our finger tips, it’s easier than ever to communicate with friends and family around the world. However, there is also a downside to the convenience the technology provides, which is cybercrime. Fraudsters (often referred to as ‘scammers’) are using this technology to hack devices and commit fraud. We’ve prepared a comprehensive document with Fraud Prevention & Security Guidelines, which you can click here to view. The purpose of this document is to provide Fleur customers with information on fraud prevention and how to avoid becoming a victim of cybercrime. We recently emailed a link to the guidelines to all our customers. If you did not receive our email, or would like to read the email again, please click here. You can also find more information below by clicking on the headings, and further details will drop down. If you would like any further advice on avoiding fraud, or to report a scam, please call us on 0333 320 4020. An increasingly common scam is where the caller claims to be from a legitimate company such as Fleur Telecom, BT Openreach, TalkTalk or Microsoft. They pretend there is a problem with your computer or broadband connection, or there are errors with your router, which they can help fix. We advise not to follow the caller’s instructions, but to instead hang up the phone, wait at least five minutes to ensure the call has been dropped, and call Fleur Telecom to report the scam on 0333 320 4020. 1. They will ask you to press the Windows button on your screen, then type the letter R.
2. They will ask you to type EVENTVWR. They will then say what is displayed on the screen is a list of errors and warning messages, however, they are in actual fact, completely normal. 3. They will ask you to visit a website where they can gain access to your computer. Common websites are: TeamViewer; Windows Remote Desktop; LogMeIn; AnyDesk; AMMYY and KingViewer. Whilst these platforms in themselves are not malicious, they can be used by scammers for fraudulent activity. 4. They will then ask you to download some software which will allow them remote access to your computer. Once this is installed and you have provided the ID code to the fraudsters, they will have full access to your computer. This means they may be able to access your online banking details, as well as websites which contain your personal information. They will also be able to change or add a sign-in password so you will no longer be able to access your computer. They may demand money in return for the password, but even if they receive this money, they may continue to demand further payments and they may never disclose the new password to you. 5. As a goodwill gesture for the fabricated ‘problems’ they say you have been experiencing, they may offer you a refund and ask you to log into your online bank account. 6. They will claim they have refunded you too much money by accident, for example, £1,500 instead of £150. You will then be asked to return the difference through platforms such as Western Union or MoneyGram. Once again, whilst these are genuine services, they are used by scammers to commit fraud. What will actually happen, is they will transfer money out of your account, and it is unlikely that this will be returned to you. •	We recommend NEVER allowing a third party to access your computer remotely. Fleur Telecom will never request remote access to your computer. •	We will never ask you to transfer money through services such as MoneyGram and Western Union. Fraudsters can ask you to provide personal information by pretending that you’re due a refund or compensation for a fault. If you receive a call from someone claiming to be from Fleur Telecom asking for banking or personal account details, you should hang up and report the fraudulent attempt to us. •	Fraudsters often use platforms such as MoneyGram and Western Union because the money transferred won’t be able to be traced back to them. •	If you are due a refund, Fleur Telecom will refund the money into the bank account we have recorded on our system. We will not ask you to provide bank account details via phone. If you are asked to visit a website, or are asked to click on a link, you should ensure you are visiting the genuine website. •	Quality – does the website look professional and are the images correctly laid out? Scam websites are often poor quality, with images being taken from the genuine website. •	URL – does the link to the website seem genuine? If you are asked to visit a website which resembles www.xyz.fleutelecom.co.uk, please call us. Scammers can create free websites which looks like genuine websites, but have a slightly different website address. •	If in doubt, leave the website or search for the genuine website online before clicking on a link you have been sent. If you receive a call asking you to update your bank account details, you should hang up, wait five minutes to ensure the call has dropped, and call the company back on their official number. If you receive an email claiming your bank account details are out of date, and asking you to click on a link to update them, you should never click on these links. •	If you need to update your bank account details, or set up a direct debit, you can do this through Fleur MyAccount. Alternatively, you can call us on 0333 320 4020. •	We advise never clicking on links in emails described above. If you do, it is likely that the scammers will be able to obtain your personal details and banking information once entered on the next screen. 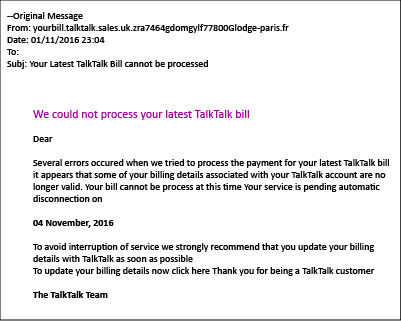 Fleur customers are billed by Fleur Telecom, not TalkTalk. 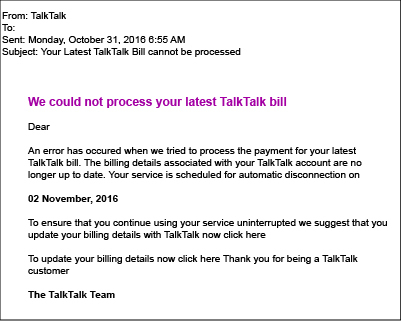 However we have become aware of a new scam where emails are being received from what appears to be a TalkTalk account but is in fact, is fraudulent. The example below shows the sender as ‘TalkTalk’. However, if you mouse over the sender’s name without clicking, you will see that the email address displayed does not look legitimate. When moving the mouse over the sender’s name, if the email address is similar to the one below with lots of random letters and numbers, it indicates that the email address is not genuine. Phishing is where fraudsters send emails pretending to be from genuine companies and try to scam the person by persuading them to disclose their private information. The details disclosed will then be used for identity theft. Phishing emails direct the reader to a website where they are asked to provide updated information, like a password, credit card number or bank account details. •	Be wary of emails which ask you to visit a website or update personal information, such as passwords, credit card details, bank account details. Fraudsters will be able to capture and steal all information entered and use them for identity theft. Vishing is the telephone equivalent of phishing. Fraudsters cold call people and deceive people into believing they are speaking with a member of a legitimate business or agency representative. If you receive a call from a person claiming to be from your bank, the police or a government department, you should be on guard. •	The fraudsters’ usual tactic is to convince a person that they have been a victim of fraud and they will ask for personal and banking details so they can gain access to the individual’s bank account. Fraudsters have been known to persuade people to transfer money to other accounts or to give cash to a courier that they believe has been organised by a legitimate organisation. They also persuade the victim to verify if the call was genuine by asking them to hang up and call their bank. However, a phone line can stay open for up to two minutes so the scammers stay on the line, playing a dialling tone to trick the victim into think they are calling the organisation. They then ‘answer’ the call as if they were the organisation. •	Fleur Telecom will never ask you to transfer money through services such as MoneyGram and Western Union. •	Fleur Telecom will never ask you to give money or your bank card to a courier. •	If you receive a call similar to the one described, always hang up the phone and wait at least five minutes before calling the organisation. We also recommend using a different telephone, such as a mobile if possible, to call the organisation to be on the safe side. If you are asked to switch off your mobile phone, or to remain on your landline for an extensive period of time, you should be cautious. •	Scammers ask you to do this to prevent your bank from calling you to verify a fraudulent transaction. Scammers are able to spoof numbers, so the caller ID can display a UK number, but then you could speak to an international caller. Fraudsters change the caller ID to make the number look convincing as you are more likely to answer a UK number, rather than an international or unknown number. •	If you don’t recognise the number calling you, even if it appears to be a UK number, please be vigilant. •	Your four digit PIN to anyone, including the bank or police. •	Caller Display: We recommend buying a telephone handset which has a screen for caller display. You can then call us on 0333 320 4020 and ask us to add Caller Display on your account. This costs only 82p/month and you will be able to see the number calling so you can choose whether or not to answer. •	Choose to Refuse: This option enables you to put a stop to nuisance or unwanted calls by stopping them from getting through to you. Choose to Refuse allows you to block up to 10 numbers and is free if you have received a fraudulent telephone call which you have reported to us. •	Anonymous Caller Reject: If a caller withholds their number so you can’t tell what number they called from, they won’t be able to get through to you. The only way they’ll get through is if they reveal their number. This feature costs 82p/month. •	Call Barring: This feature allows you to bar incoming calls you receive on your phone, as well as certain outgoing calls, if needed for 82p/month. Nuisance calls are different from scam calls in that they often take the form of silent calls and unwanted sales calls. They may be annoying, but typically do not have the same malicious intent as a fraudulent call. •	For silent calls: you should contact Ofcom (www.ofcom.org.uk/about-ofcom/contact-us). •	For unwanted sales and marketing calls: you should contact the Telephone Preference Service (TPS). This is free and easy to do, but it doesn’t guarantee to stop all nuisance calls. It doesn’t cover international calls, market research calls, or calls from companies to whom you have given your consent to call you. See www.tpsonline.org.uk for more information. It’s been reported in the news that some companies are cold calling consumers, posing as the TPS or companies with similar sounding names, and trying to trick them into paying to block nuisance calls. The TPS is clear that the service is free to use and the organisation will never contact you to request payments or card details. Once you have registered with the TPS, you will never be required to update your registration (see www.tpsonline.org.uk for more information). •	We have prepared a document called Fraud Prevention & Security Guidelines which includes tips on how to avoid fraud and what to do in the event of receiving a scam call or email. It also provides examples of the different types of cybercrime and the jargon used. •	We are continuing to send eshots to all our customers with examples of scams, and a link to this guide. Please see the copy of the Fraud-Prevention-Email. •	We offer Fleur Security Suite for Windows devices, which provides Symantec Endpoint Protection to proactively identify files that are at risk and stop threats. It also allows you to block inappropriate websites. Fleur Security Suite is free for 12 month broadband contracts, and costs just £2/month for 30 day broadband contracts. More information can be found by visiting: fleurtelecom.co.uk/products/fleur-security-suite/. •	We take all necessary steps to ensure our systems are secure. •	We do not believe in passing customer information to third parties without permission. •	We offer a variety of call features for 82p/month, including Caller Display, Anonymous Caller Reject and Call Barring. We also offer Choose to Refuse for free to customers who have received a fraudulent call which they have reported to us. You may find the following links useful for more information on preventing fraud.